“It takes generations to make who you are " (Faith Holyan). Powerful and eloquent words from a young woman, but given her background and family, it is no surprise. Faith Holyan is the daughter of Carole Jackson Holyan and Ed Holyan, the granddaughter of Dean C. Jackson, and recently discovered, also a descendant of Chief Manuelito and Juanita. Faith is Bilagáana born for Naasht’ézhí. Her cheii is Kinyaa’áanii and her nálí is Tł’ógí. Faith Holyan is a powerhouse in the rodeo circuit, with wins and accolades beginning when she was just 9 years old. Faith is a young Diné woman who has created a name for herself as a cowgirl who is as skillful in competition, as she is reflective. Faith has qualified to compete at the Indian National Finals Rodeo 8 times, and has qualified twice at the National High School Finals. She has won a state title in Breakaway roping and one All-Around World title. Faith has also become an advocate for suicide prevention and created a social media campaign to connect peers going through difficult times. I had the honor of reconnecting with Faith Holyan, who is my cousin, for an interview to spotlight her accomplishments and explore how she got there. I invited her mother, Carole Jackson Holyan to weigh in, as well as my own mother, Florinda Jackson. To tell Faith’s story is to explore the generations that came before her and honor the work of our grandfathers, Dean C. Jackson and Jack C. Jackson Sr. These identical twin brothers were two of the founders of the All-Indian Rodeo Cowboys Association. They were the first to formalize the sport of rodeo on the Dine’ reservation and establish the rules for operation that are still in place today. “You can go out and face any obstacles if you understand your own strength and understand Mother Earth and Father Sky" (Florinda Jackson as remembered from a statement by Jack C. Jackson, Sr.). Dean and Jack are Kinyaa’áanii, born for Áshįįhí. Their cheii is Táchii’nii and their nálí is Tódích’íi’nii. They were born in Teesto, Arizona in 1932. Jack recalls, the government had a great idea’ to send Navajo kids off the reservation, in an attempt to forget about their language, their way of life, and assimilate with mainstream society. “If they forget about their culture and way of life, they become better citizens. That was the crazy idea that they had.” In the 1940’s, when the wave of rounding up young Navajo children and sending them to boarding schools hit Teesto, Jack and Dean were “one of their victims” and sent to Chilocco Indian Agricultural School in north central Oklahoma. In 1949 a special program for Navajo youth began and the objective of the school was to integrate and assimilate American Indians into the mainstream of American life. The two brothers attended the Chilocco boarding school through their adolescence and returned home in the 1950s. Grandpa Jack and Grandpa Dean often referenced their observation of the organized rodeo scene and competitive structure in Oklahoma. Upon their return, Jack and Dean set out to formalize the rodeo circuit and created the All Indian Rodeo Association in 1957.They wrote the rules and bylaws, and most notably and unpopular at the time, prevented the allowance of alcohol consumption at rodeos. Jack and Dean were influential in creating the structure for indigenous cowboys and cowgirls to find a platform for their care of horses and livestock and like Faith, develop a career and lifestyle as a competitor. Faith was 5 years old and she was competing in barrel racing at the Sacaton Junior Rodeo. “I remember when they told me I had won. It was my first rodeo and I was hooked” she said. Faith remembers her aunt Debbie asking for an autograph and at that time Faith didn’t know how to write her A’s so the autograph looks is like a circle with a stick next to it. Carole was competing at the Window Rock Fair when she was 6 years old and barrel racing in the Junior Rodeo. There was a big crowd and it was a big celebration. “I remember being in awe of everything going on” she said. Everyone was involved, from parents to cousins to friends and it was a fun time. Florinda was in third grade, in the late 1960s, and she was with her father, Jack. It was the first time the rodeo association had allowed kids to participate and it was an added attraction to the day. “Learning goes beyond four classroom walls” (Carole Jackson Holyan as remembered from a statement by Dean C. Jackson). Education has always been a tenant of the Jackson family. However, the philosophy of education that was promoted by Dean and Jack extended beyond the “western” form they received in boarding school that attempted to replace their traditional teachings. Dean and Jack promoted a duality of learning that incorporates Diné philosophy with Western education. Carole remembers missing school to travel for rodeos as a young child and her father, Dean would often go to the school to explain to the staff that his children were still learning. Learning about new things, new people and traveling through the region of the traditional teachings and within the four sacred mountains. This idea has extended to Faith’s experiences as she has been home-schooled for much of her school time. She has traveled all over the country for competition and carries the understanding from her Cheii Dean, that you can get an education while rodeoing, it is possible to do both. The saying goes, that beyond every great man, is a great women. That statement continues to ring true in the Jackson story. This exploration of Faith would not be complete without mentioning the women. Stephanie Jackson, wife of Dean Jackson and mother of of five children. Eloise Jackson, wife of Jack Jackson, Sr. and mother of four children. In every memory shared from Faith, Carole and Florinda, the recurring theme was family. Rodeo is a labor of love, a family affair, and even the horses become a part of the family. As Florinda, recalls when it comes to rodeo and caring for animals there is a high expectation for all, no matter whether you are female or male. However, as women there is a dual expectation to care for animals and care for the household. As a matrilineal society there is a deep responsibility for Diné women to set the tone for the family and these stories of success would not be possible if it were not for the support of women like Stephanie and Eloise Jackson who as educators themselves, raised successful children. It was this ideal that prompted Carole to relocate her family and Faith back to the reservation from Tucson, Arizona when she was in fourth grade. The family moved to Coyote Canyon, New Mexico. As Carole puts it, she wanted Faith to understand who she was and to do that, she needed to get her “home.” It would not have been in Carole’s father teachings, she stated, if her children did not know the Diné way of life. With this new sense of direction, and new involvement with family, Faith soared in her training and in competition. Faith has a deep understanding of the female influence and notes prominent woman as her heroes - her mother, Carole Jackson Holyan; her aunts Dr. Debbie Jackson Dennison, Charlene Jackson, Deanna Jackson; and her cousin Kassidy Dennison, fellow rodeo champion. She has taken lessons and advice from these powerful women and when she is heading into competition time, she tells herself: score sharp, rope sharp. Keep sharp, Faith. Ahéhee’. Faith: Empower yourself and learn about your surroundings.Remember the women who came before you and who are a part of your past. Carole: Explore and open your eyes and thoughts to other things and other places; while you are young enough, do different things and try new things. Florinda: If you know you are a strong determined young person, then learn to put your goals and dreams in progressive steps to get there. When obstacles come about, you can get through them if you take it in pieces and it is no longer an overwhelming endeavor. Author notes: Shi’ei Kelly Hubbell-Hinton yinishyé. Tó’áhání nishłį́, dóó Dibé Łizhiní báshíshchiin. Kinyaa’áanii dashíchei dóó Honágháahnii dashínáłí. I write with a social worker lens and from a place of indigenous empowerment. I was honored to speak to women across generations and research our family history and strong connection to rodeo. 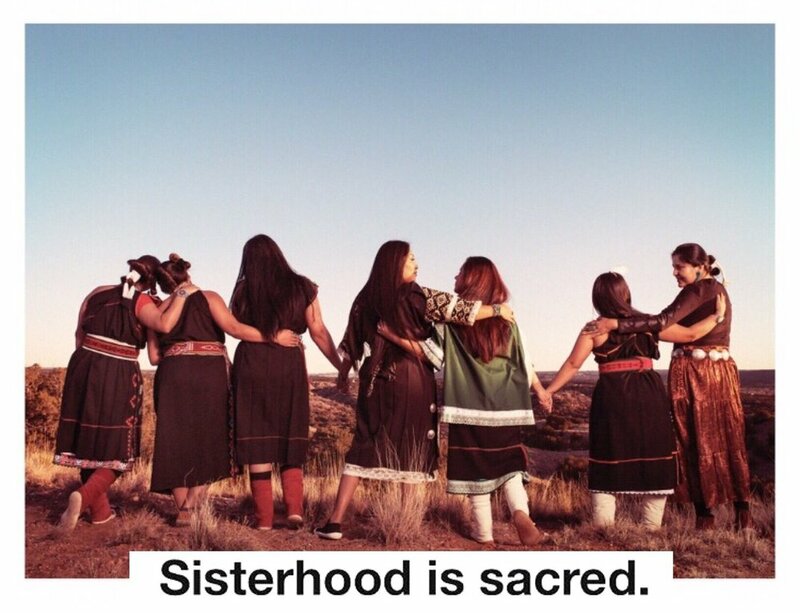 Ahéhee’ to the Indigenous Goddess Gang for your shining presence in the movement.